I do have the coolest job ever! A slap upside the head always comes when you least expect it. “You have the coolest job ever,” said a hockey fan standing behind me admiring one of my photos at the Spokane Arena last night. 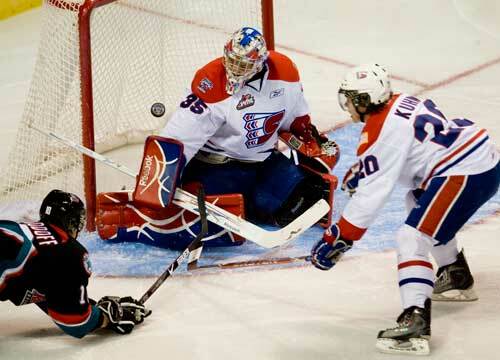 I was on deadline preparing to transmit my pictures of a blowout Spokane Chiefs hockey game back to the paper when those six words stopped me cold. Up until that utterance, I’d beg to differ. It had been a long 14-hour day and I was tired. I started in the morning shooting a freelance job. I take extra work now whenever I can. It helps make up for the furlough days and pay cuts I have endured over the past year. The economic trauma and turmoil facing my and every other newspaper in the country weighs heavily on my shoulders at times. When someone asks me why I entered the newspaper biz, I tell them it’s because I have a passion for telling stories. Like any good photojournalist, I see the world a bit differently from most people. There is a creative energy that burns inside me. When I put a camera up to my eye, life becomes my palette. I felt it when I bought my first professional camera in high school and I still feel it today…well most days. As I sat there hunched over my laptop, awareness washed over me. Here I was at a hockey game that I didn’t have to pay to get in, surrounded by the best cameras, lenses and laptop that I didn’t have to buy. The only thing missing was a cold beer by my side. Looking back over the past seven days at some of what I have produced for the readers of my newspaper and viewers of our website, I realize that I can’t let the uncertainty of the future kill my creativity. Today, I put a sticky note on my computer monitor that simply says, “Try Harder.” It is my little reminder that (slap upside the head) I do have the coolest job ever! 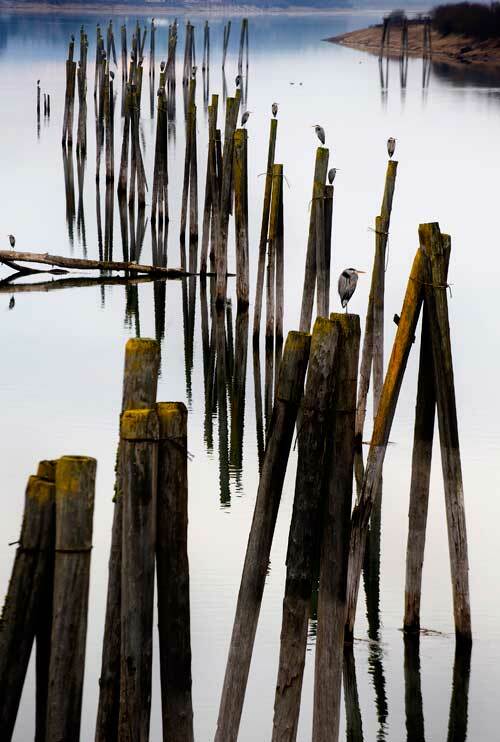 These are some of the highlights of my past week– a mix of multimedia and stills. 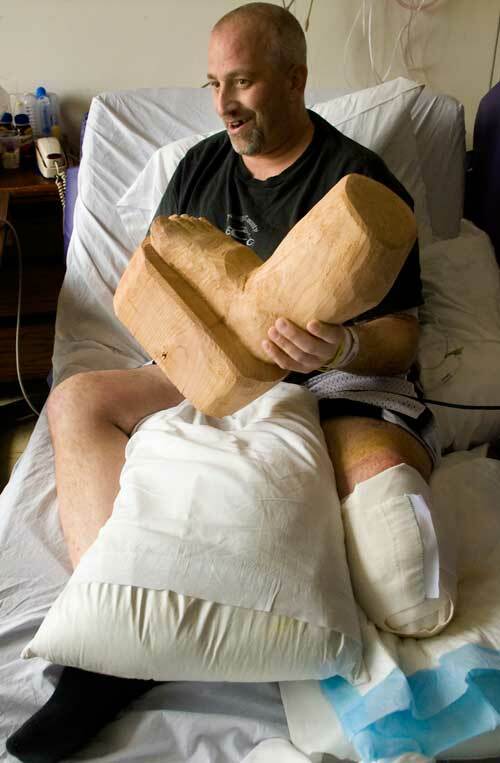 Tim Michaels, who lost part of his leg in a grain elevator accident holds a wooden foot carving a relative brought him during his stay at Providence Sacred Heart Medical Center in Spokane, Wash. Videos: Click image to view. The king of Cat Tales Zoological Training Center gets a root canal. In the Kalispel Tribal Language Program, new Salish speakers immerse themselves in daily conversation with elders and then teach what they have learned in nearby public schools. Will the touch tablet save professional journalism? Truth be told, no one really knows when printing presses will grind to a halt and news delivery boys and girls will be forced to hang up their logoed paper bags for good. I had to laugh, last week in Portland, Oregon, my former newspaper editor Steve A. Smith was the keynote speaker at “We Make the Media”—“A conference held to develop real-world plans for new media organizations to fill the journalism gaps left by shrinking news staffs at legacy media organizations.” As Smith was speaking about the need to save “professional” journalism, back in the corner of the room were a bunch of self-proclaimed snarky bloggers and citizen journalists who took offense to the notion professional journalism should be saved. Of course they twittered their opinions of Smith’s speech in real time. This, I guess, is the new digital divide, where any journalist older than thirty is viewed with mistrust. Hmmm, where have I heard that before? It does seem the pace of handwringing is accelerating. The print folk, locked in their silos, are defending their turf as they make their last stand. Online departments are taking the brunt of the next wave of job cuts. If newspapers can’t hold the line on circulation and revenue, it will soon be curtains for the rest of us still drawing a paycheck. Or so I’m told. I hope I can last a bit longer, only because I truly believe, if we can make this digital transition, the future will not be as dismal as I was once led to believe. What will sell the tablet service is all the new things subscribers will be able to do with their wireless digital newspapers. Pictures will come alive with video and audio, graphics become interactive with a tap of a finger, Text can be set to be read aloud. Subscribers should easily be able to customize the paper to fit their needs. Want the sports page as your front page? No problem. Want more stories about your favorite pro baseball team? You bet! The value to the tablet subscriber has to be so huge that they be crazy not to plunk down their cash. The same goes for advertisers, whose ads will now have added value. Tap on an ad for a big-screen TV at Best Buy and get more info about the product. Tap a grocery store coupon to print it out. Advertisers should be allowed to update their ads in real-time. Think about it. Let’s say you’re a local shoe store looking to move 1000 pairs of shoes. You place the ad in the morning showing the shoes at 20% off. By 2 p.m. you have 500 left and you want to sell them faster, you log into your account and update the ad yourself, dropping the price to 30% off. Don’t you think a whole bunch of those types of ads would draw traffic to a digital newspaper? How about subscriber-only deals? Advertising will be targeted to subscriber’s tastes and talents. Everyone talks about how they can’t make any money in online. The simple truth is most newspaper Web sites are not easy to navigate. They can’t display ads as effectively as a print newspaper. If newspapers are going to make this digital transition successful, then making the viewing experience for former print subscribers and advertisers as elegant as possible is paramount. Finally, a few words about content. Our journalism is what’s most important and will no doubt have to be upgraded. Words and multimedia will need to work better together. The strength in the touch tablet is in its multimedia capabilities. Visuals like photo galleries, graphics, and hi-def video, will add value. Like your current Web site, the front page of the digital newspaper will change as stories are updated throughout the day. The page design will slowly change to integrate new content features. Once this happens, the true digital media revolution will begin to take place. Yes, the presses will eventually stop, which will only strengthen digital media’s position. Freed of the cost of printing and distribution, more resources will go to content creators. This is when the fun really starts. True innovation will kick in with each new tablet version. New types of devices will drive even more innovation and hopefully a super-renaissance of journalism. My vision may be utopia to some, but the internal optimist in me really believes there is a future in professional journalism. A few weeks ago I wrote a post about quality video vs. quantity. In it, I asked ten questions you should ask before your newspaper dives deeply into video storytelling. Both Rob Curley of The Las Vegas Sun/Greenspun Interactive and Angela Grant with Newsvideographer.com shared their answers. In regard to the “quality versus quantity” video debate (which is the whole point of his post), I think we’ve thrown our support clearly in the “quality” category … but probably in a different way than the writer of the blog above probably means – but I’m totally making assumptions there. I think his answers give me a working definition of the type of leadership that I’ve been craving in my own position. He has a vision and plans for higher-level strategies that I believe are necessary to enjoy a successful video endeavor. Thanks Rob and Angela for helping me answer my own questions!